Hey guys! 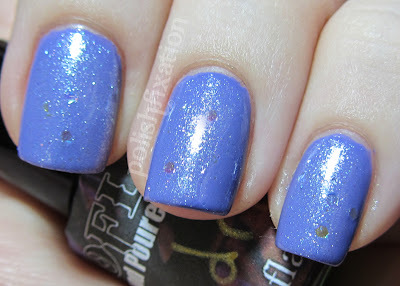 I have some new Soflajo polishes to share with you today. These two are some pretty topcoat glitters from the Spring Flowers collection. The collection consists of 6 glitters, frosts, and shimmers to mix and match in any way you want. The colors I have to share with you are Dewdrop and Fields of Clover. Dewdrop "is a sparkling white frost with bits of iridescent color flecks". I layered this over Bettina Flip Flop. I love the delicate glitter in this polish. It applies nicely and isn't gritty or clumpy. I think it would be fun to layer it over more colors to see the different looks you can achieve. 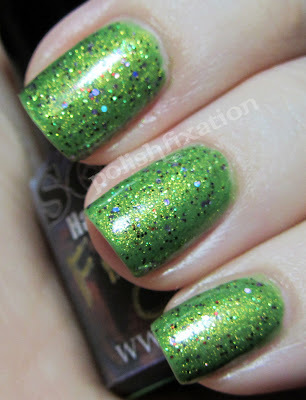 Fields of Clover "is a lively green based micro-glitter bursting with greens, golds, purples and pinks". I chose Revlon Bonsai to layer this glitter over. I think it was the perfect color to bring out the springy colors in this polish. I really love this combo! Once again the glitters are fine and not gritty at all. A great look for spring, or any time! What do you think of these Spring Flowers Colors? Have you tried any Soflajo polishes yet? Gorgeous!! Fields of Clover is my fave!! Gorgeous! I love Flakes of Clover! Oh this hurts my eyes... I LOVE THEM SOOOOOOO MUCH!! !